The idea of a band was planted in early 1964, influenced by "The Rebels", an electric guitar band of the school "TSYK" in Turku. 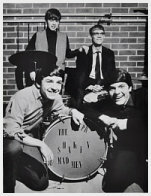 The thought got materialized in October when the group was established carrying the name "The Shakin' Madmen". In the very beginning the group consisted of four musicians, Olli Lundstedt (vocals, lead guitar), Markku Nurmela (vocals, rhythm guitar), Jukka Laurikko (bass) and Pekka Rahi (drums). At the beginning of 1965, Rahi was replaced by Matti Laurikari. In the summer 1965 Bert Karlsson, lead guitarist from "Jolly Jokers", joined the group. Olli gave up playing and focused on the vocals. In may 1965 a musical competition "Ponnahdus Pinnalle" ("A Bounce to Fame") was arranged by Turku Journalist society. Madmen was nominated as the definite favourite of the public. In October Madmen scored as the winner of "SM-kitara" (Finnish Guitar Mastership) band competition, beating all the toughest rivals in the area, The Sharks, The Firestones, The Road Runners, The Shouting Saints and the Strangers.